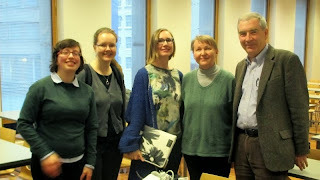 Heather Froehlich from the University of Strathclyde, Glasgow is visiting the English subject and the Varieng Research Unit at the Department of Modern Languages, University of Helsinki. Froehlich studies representations of gender in Early Modern London plays as part of the Visualizing English Print 1470-1800 project, and she works with DocuScope, a text analysis software which provides interactive visualisation tools for corpus-based rhetorical analysis. 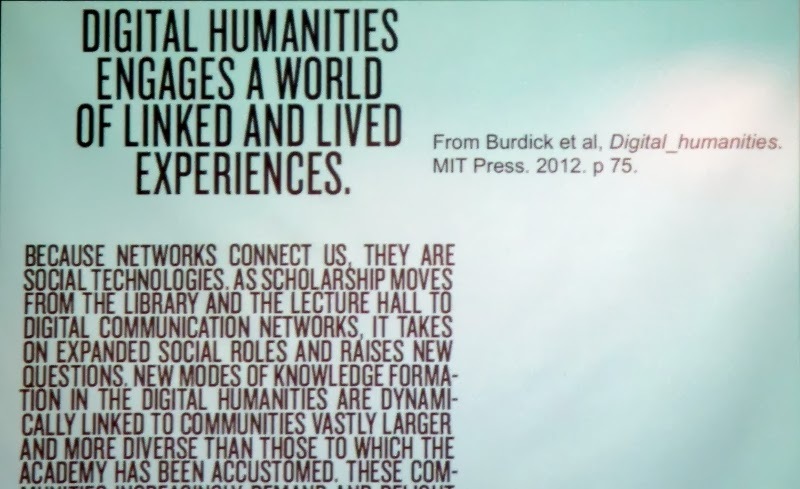 In her presentation, Froehlich discussed in detail different aspects of digital humanities. She posed a series of questions related to the role of digital and computational tools within humanities. She cited Ted Underwood who has stated that "there is actually a lot of low-hanging fruit out there still worth picking - big questions that are easy to answer quantitatively and that only require organizing large datasets". Froehlich mentioned methods that are commonly used within digital humanities including creating and maintaining digital archives (Omeka, Scalar), text encoding (TEI), network analysis (Gephi), text analysis and topic modeling (MALLET) and data visualization. A division into questions that easy and those that are "easy" to answer was discussed. Referring again to underwood, Froehlich discussed the need to go beyond binary categories, i.e. to deal with questions of degree. She also reminded that "simplifying topic models for humanists who will not (and should not) study the underlying algorithms creates an enormous potential for groundless - or even misleading - insights (see "Words Alone: Dismantling Topic Models in the Humanities" by Benjamin M. Schmidt in the Journal of Digital Humanities). Froehlich emphasized collaboration as an important feature of digital humanities. Only in some exceptional cases people have experiences and skills in multiple disciplines that are needed to conduct digital humanities research successfully. Rather, digital humanities is essentially a networked activity that challenges researchers to reach over disciplinary boundaries. Digital humanities thrives on (1) a network of people, (2) openess, and (3) experimentation. Humanists are learning about computers, but computationally driven are also learning about the humanities. Towards the end of her presentation, Froehlich discussed fora and resources. For instance, Jeffrey Schnapp has written A Short Guide to Digital_Humanities in Digital_Humanities by Anne Burdick, Johanna Drucker, Peter Lunenfeld, Todd Presner, MIT Press, 2012, pp. 121-136. Organizations include Alliance of Digital Humanities Organizations (ADHO) and European Association for Digital Humanities. To relevant journals in this area belong Literary and Linguistic Computing, Digital Humanities Quarterly, and Journal of Digital Humanities. Heather Froehlich was hosted by Anni Sairio, Tanja Säily and Terttu Nevalainen. The discussion was active and in addition to the Finnish participants, insightful remarks were presented by William Kretzschmar who is also visiting University of Helsinki. 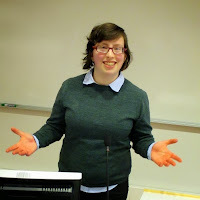 Kretzschmar pursues research and teaching on American English, language variation, and computer methods for description, analysis, and presentation of language data from literary and non-literary sources. It is all dependant upon the digital developers to develop such a community and provide dissertation assistance writing to the students so that they can have better idea and become a source for the country to grow. There can not please the process of human development goes on. Society increasingly immersed in digital technology. Everything becomes much easier for even writing term papers, essays, resumes and more. This is done by means of special sites. Simplifying life for students.